← Eczema and Bleach Baths! This ad campaign by the Milwaukee Health Department certainly got a lot of attention, most of it negative. And there’s good reason for the anger. The AAP’s recommendation that babies not sleep with their mothers is controversial and not necessarily supported by the evidence. 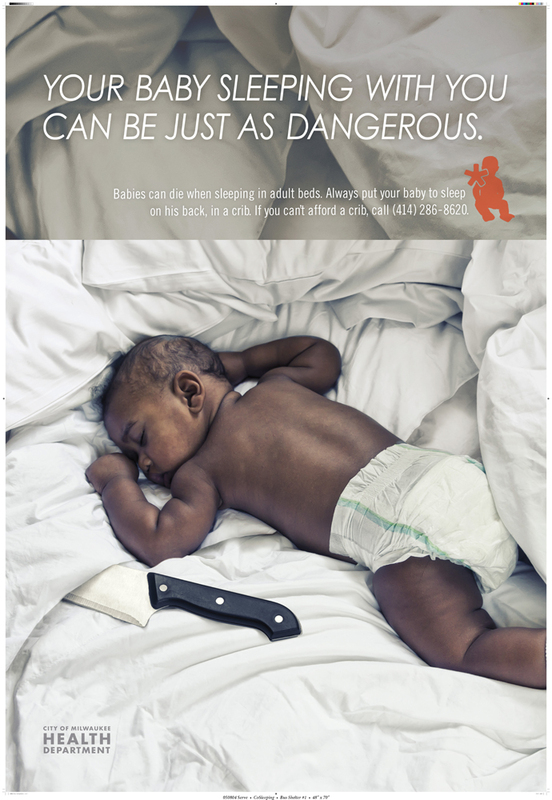 Additionally, the ad campaign itself illustrates the best argument against its message: a baby put to sleep on his stomach, on a soft fluffy mattress with a pillow next to him and voluminous comforter over him is truly being put in a dangerous situation. That baby might as well be cuddled up to a knife in his crib if the crib contains all those elements. They are known risks for SIDS. And safe bed sharing is about avoiding them. So, what does the AAP say? Room-sharing without bedsharing is recommended— There is evidence that this arrangement decreases the risk of SIDS by as much as 50%.5,7,30,31 In addition, this arrangement is most likely to prevent suffocation, strangulation, and entrapment that might occur when the infant is sleeping in an adult bed. Of those cited studies, I was able to review 3 online. Now, I’m not a scientist, and I have no formal training in interpreting research, but it looks to me like “bed sharing” in these studies is defined pretty broadly. And even when they differentiate between the parents’ bed and sleeping on a couch or recliner (always a bad idea), they don’t differentiate between a safely prepared parents’ bed and the type of dangerous environment depicted in the Milwaukee ads. Interestingly, risk factors for death in the parents’ bed include the infant being very young, the mother being extremely fatigued, and overcrowded housing conditions, in addition to use of a duvet. All of those factors say to me, “unplanned bed sharing.” People who don’t intend to sleep with their babies wind up doing so because they’re so exhausted (been there! ), a situation common when the baby is less than 3 months old. Or parents have to chuck the baby in bed because there’s nowhere else for him. Is it possible that unsafe bed sharing is the risk, not bed sharing itself? Just as a crib with fluffy bedding, bumpers, and stuffed animals can be dangerous, a poorly-prepared parental bed can be dangerous. James McKenna, the director of the Mother-Baby Behavioral Sleep Laboratory University of Notre Dame, has created a stringent checklist for safe bed sharing. He warns parents against the risks we know really do endanger babies, from parental alcohol use to gaps between the mattress and bed frame, and gives a comprehensive plan for setting up an adult bed for safe infant sleep. What he’s done is right in line with all the warnings we get about safe crib sleeping: firm surface, nothing fluffy, baby on his back, and so forth. As far as I know, no study has analyzed the outcomes for babies sharing sleep in this way. All the research includes any old bed arrangement. It may be that prudent bed sharing is no more hazardous than sleeping in a crib. Indeed, bed sharing might be a healthier overall choice, if parents do it with proper precautions. This is because bed sharing facilitates breastfeeding, which protects babies against many health problems. If proper research were done on cautious bed sharing, would it show that it’s just as safe as a proper crib arrangement? We don’t know. And it is true that bed sharing includes more variables that have to be managed – adult beds aren’t safety tested like cribs, and you have to account for the mom’s condition. But bed sharing can be a real life saver for so many families, it’s a shame to see the AAP toss it aside in this way. Basically, the AAP is assuming that people are too stupid, ignorant, or lazy to bed share safely. After all, auto accidents are the leading cause of death for children over 1, but the authorities haven’t issued dire warnings not to drive children around in cars. It’s understood that parents are going to drive around with their kids because it’s convenient and facilitates their lifestyle. So parents are given information on how to make car rides as safe as possible for their children. Properly installing and using a car seat may not be the most simple and easy set of behaviors, but government agencies and child safety groups make sure to educate parents and offer support for safe car use. Can’t they do the same for bed sharing? Posted on December 6, 2011, in Parenting and tagged bed sharing, co-sleeping, milwaukee ads, SIDS. Bookmark the permalink. 3 Comments. If you’re interested in the data, I did some research myself (and have access to all the articles) and wrote this piece on bedsharing and sids: http://www.evolutionaryparenting.com/?p=186. Thanks Tracy, that was really enlightening! It’s also nice to see my intuition on this confirmed. And now to read everything on your blog . . .